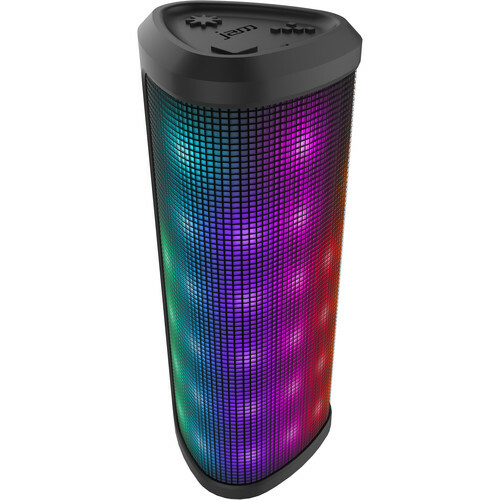 Light up the party with the Trance Plus LED Wireless Light Show Speaker from jam. This wireless, Bluetooth-enabled device enables you to stream audio from any compatible device from up to 30' away. In case you don't have a Bluetooth-device handy, the Trance Plus is also equipped with a 3.5mm aux port to line-in audio from any device with a headphone jack. To add some color and a little personal flair to your next event, the Trance Plus features 36 different LED light programs that sync with your music. Additionally, it's equipped with an integrated speakerphone, so you can switch from music to conversation in case you get a call. The Trance Plus is powered by a rechargeable lithium-ion battery that delivers up to 10 hours of streaming music (with accompanying light show) on a full charge. Connect wirelessly with any Bluetooth-enabled device within a 30' range. Choose from 36 LED light party programs that sync with your music. Answer calls directly from your Trance Plus speaker. The Trance Plus speaker tells you what it's doing-powering on, connecting, and more. Voice prompts are available in English, Spanish, French, and Portuguese. Charge for 3 hours to provide up to 10 hours of play time. The Trance Plus is about the size of a water bottle, making it easy to take with you. This speaker's exterior is designed for protection. Box Dimensions (LxWxH) 8.9 x 3.5 x 3.3"
Trance Plus LED Bluetooth Light Show Speaker is rated 5.0 out of 5 by 1. Rated 5 out of 5 by Nya from Love it!!! This speaker is awesome. One of my friends had one and i immediately went to purchase mine. The charge lasts a really long time and it's so light weight you could carry it in your purse. The volume is really good as well and i like the different light settings. As per manufacturer it would have Input: 5v, 750mA.